... (the work) is meticulously researched and full of unsparing biographical details. The book manages to bring out the multi-dimensional personality of the man in a style that is both lucid and engaging. A magnificent book about a magnificent personality. 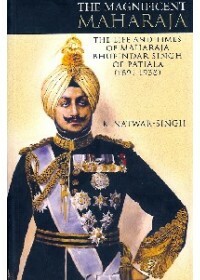 (A) factual, thorough stylised biography of the man and the maharaja. (A) largely impartial study (of Bhupindar Singh). A glowing tribute to MBS. (Singh) has done exhaustive research on the topic. One of the most authentic, informative and objective biographies of our time. K. Natwar Singh was born in 1931. He was educated at Mayo College, Ajmer, Scindia School, Gwalior, St. Stephen's College, Delhi, and Corpus Christi College, Cambridge. In 1953, he joined the Indian Foreign Service. For the next thirty-one years he served in Peking, New York, Warsaw, London, Lusaka and Islamabad. He was Ambassador to Pakistan — 1980-1982, Secretary General of the Seventh NAM Summit — 1983. The same year he was Chief Co­ordinator for the Commonwealth Summit. In 1984 he was awarded the Padma Bhushan. After resigning from the I.F.S., he joined the Congress party and was elected to the Lok Sabha in December 1984. He was the Union Minister for Steel, Fertilizers and External Affairs from 1984 to 1989. He was attached to Indira Gandhi's Secretariat from 1966 to 1971. In 1987, he was elected President of the U.N. Conference on Disarmament and Development, and was leader of the Indian Delegation to the 42nd Session of the U.N. General Assembly. In 1998 he was again elected to the Lok Sabha. In 2002 he became a member of the Rajya Sabha. Since May 2004 he is Minister of External Affairs. - With his staff before audience with Pope at the Vatican, 1935. Introduction To The Book 'The Successors Of Maharaja Ranjit Singh' By S. P. Gulati Maha..